The Home of the Heisman. 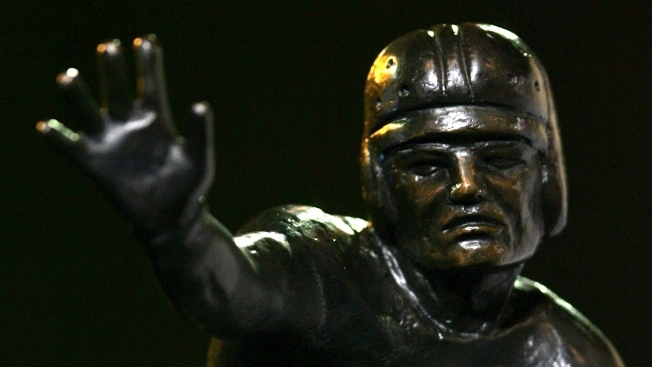 There are 926 Heisman voters, 55 of them are the living trophy winners and there’s one fan vote. The other 870 are media members like the voice of Cal Basketball, Roxy Bernstein, who also broadcasts a national college football radio game of the week and was nominated to become a Heisman voter for the first time this year. That trophy winner is Bay Area native Gino Torretta who starred at quarterback for the University of Miami after playing at Pinole Valley High School. Soon after, they sent him a ballot for an online vote of his top three candidates. So how does a guy who welcomes you into his home with an Oski-adorned Cal doormat vote with a Stanford Cardinal on the ballot?